Ignatius had sold over 120,000 copies, but the project was put on hold because of the economy and the large cost to produce–about $200,000 each. I haven’t pushed Ignatius because I have been busy leading pilgrimages, writing bible studies, and speaking around the globe. But last year I got a call from Joe Reed in Midland Texas … he uses the DVDs for education in his parish. He asked the same question. Instead of shrugging his shoulders when I answered — he put together an action plan for a fundraiser. He set to work organizing in his hometown of Midland Texas (affectionately called “oil-country”). I cannot begin to tell you all the efforts he put into bringing local parishes together, securing the Bishop’s approval, spreading the word, arranging the Midland Center which holds 1000 people, and even getting the story into the newspaper. The planning stage is finished–we are here in Texas putting on a Parish Mission at the Midland Center. I will be speaking for four nights about my conversion, Mary, Peter, Abraham and the adventures and miracles we had while filming the first seven movies. Ignatius Press created a tax-deductible account and sent their employee Diane Hanson to help as well. Can you help finish the series? You can help without leaving your home by making a tax-deductible donation to Ignatius Press. 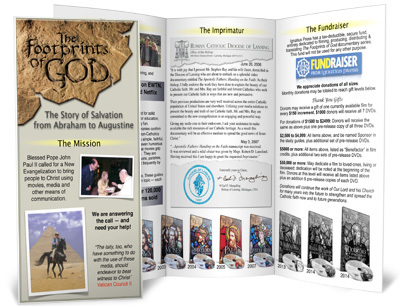 This goes exclusively to financing the project and finishing the Footprints of God series. Documentaries left to film: 1) Abraham: Father of Faith & Works, 2) Elijah & Elisha: Conscience of the Kingdom, 3) Doctors of the Church: Defining the Faith.